An Equation or a Requiem? Darren Aronofsky's The Fountain was as eagerly awaited as it was long awaited. Budget and cast problems delayed the project by several years, and there was a time it seemed doubtful Aronofsky's big vision would ever hit the screen. Yet in 2005 the project was resurrected with a smaller budget and Hugh Jackman and Rachel Weisz replacing Brad Pitt and Cate Blanchett in the leading roles. It was within these parameters that the film was able to be completed and finally released in 2006, four years after its initial filming schedule. The film takes place over three different timelines; 16th Century Spain, present day America and far future space. All three revolve around a similar character played by Hugh Jackman and a parallel romantic figure played by Rachel Weisz. In narrative terms each follow a journey. The first is a quest to find the tree of life, the second a professional and personal race against time to find a cure for cancer, and in the third part a more ambiguous and minimal narrative shows the journey of an exospheric space craft containing the Jackman character and the tree of life passing through a nebula. All three of these intersect each other throughout the film and although the flow may seem disorientating at the beginning as you get used to Aronofsky's rhythm and pace, a certain amount of clarity emerges. This film is in some ways very different from his first two features. Both Pi and Requiem for a Dream deal with microcosms, thematically and in style. Pi studies the troubles one man has when he discovers the secret equation to the universe. That is a pretty big discovery, but the film is really about the character and how mathematics could be the key to understanding much of the life we live. The Fountain is an altogether larger work, but it shares more thematic similarities with Pi than with Requiem For a Dream in which Aronofsky uses his unique directorial abilities to interpret a book by someone else, whereas his other two features have both been straight out of his own imagination (in The Fountain's case, with a little help from Ari Handel). The Fountain comes into its own most obviously with its pacing. Aronofsky rejects his high octane editing techniques and flashy camerawork he has become known for in favour of a more considered and mature approach. There is little in the way of tightly edited fast paced scenes with many short shots, most of The Fountain plays out in as grandiose a way as the story dictates. But what it does share with his previous pictures is a fabulously artistic eye. The cinematography by Aronofsky regular Matthew Libatique is breathtaking from start to finish, and I am hard pushed to find a single scene that does not contain something truly special in mise en scene. Aronofsky and Libatique have shown us the beauty in the ordinary, and sometimes vulgar, with their first two films, and that is taken care of masterfully in the present day section of The Fountain. But it is in the larger scale scenes that they have never been able to film together until now, where we see the scope and capability of Darren Aronofsky's vision. Form truly meets content with the huge tree of life, the towering Mayan temple, and in the expanses of outer space, all of which frame Jackman's character, the symbol of humanity, next to them to truly illustrate scale. 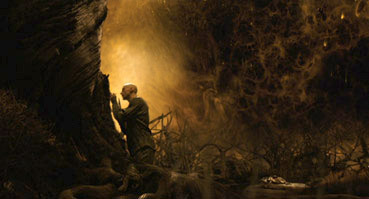 Technically, the budget constraints faced on the production forced Aronofsky to incorporate macro photography with computer generated effects. This lends a strange injection of reality into the on-screen effects, creating another layer to the visuals that pure CG would not have attained, as well as watering down the CG that is so often overpowering in today's big budget pictures. I believe, like many a film, this work owes much to Joseph Campbell's concept of the 'Hero with a Thousand Faces'. Each section of the narrative triptych is a clear journey from A to B, even if it is not always clear where the journeys end and the resolution may be. It is in these doubts and mild confusions that the hooks of the film reside. Thankfully, the answers to such questions are never fully explained, thus leaving room for speculation, and there has already been a lot written about the film's possible meanings. It is enigmatic in a way that may steer some towards David Lynch comparisons, although there is less surrealism in The Fountain than in Lynch's more abstract narratives but more direct symbolism and recurring motifs. The semiotics revolve around light and dark, life and death and the passage from one to the other. Religion as a basis for existence is explored as the film opens with a bible quote and there are allusions to many religions other than Christianity, most prevalently Buddhism. The entire piece moves from dark to light, towards enlightenment, and the two main characters depicted in each segment could be read as reincarnated versions of the same souls. 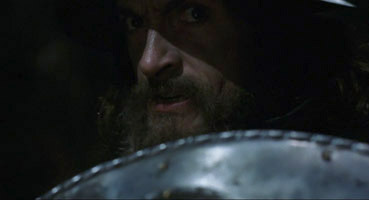 The direct facing of death by Weisz's present day character reflects the direct facing of eternal youth by Jackman's conquistador in the past. Although this is not the only reading, as the past is fictional in the world of the film (a book being written by the present day Weisz) and it is possible the final section is purely symbolic, thus rendering the present day world the only 'real' one. But this is all for the subjective audience to decide themselves. Aronofsky has compared the movie to a Rubick's Cube with one real solution, but many different ways of getting to it. I like that idea very much. 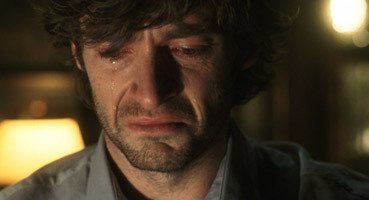 The performances are excellent across the board (with a welcome supporting role from Ellen Burstyn), with the real accolade going to Hugh Jackman, who gives a mature enough performance to convince all that there is life after Wolverine. And I couldn't wrap up this review without mentioning the sublime soundscaping created by Aronofsky's usual composer, Clint Mansell. I love his work and it is great to see a Brit musician thriving on Hollywood soil! He was also helped in the score by the post rock band Mogwai, which I am also glad to hear of as I have thought since first hearing them some years back that they were destined for film scoring. Their distinctive sound coupled with Mansell's sometimes Philip Glass-esque scoring is yet another reason why this film has become a recent favourite of mine. The Fountain is a wonderful achievement that may surprise some Aronofsky fans, but if persevered with it reaps great rewards. A treat for the eye and mind alike, this is a milestone for an already great director and in a perfect world I could see this being to Aronofsky what 2001: A Space Odyssey was to Kubrick. At least it deserves to be! The Fountain is sometimes visually a dark film with an extensive use of low key lighting, traditionally a challenge for DVD encoding if you are going to avoid loss of detail while retaining black levels and contrast, but this 20th Century Fox disc delivers the goods, although a darkened room is recommended to get the best out of it. The framing is 1.85:1 and the picture is anamorphically enhanced. The Dolby 5.1 soundtrack has very nice separation with effective use of the surrounds and the occasionally burst of LFE bass to keep the subwoofer exercised. Clint Mansell's score sounds particularly impressive. This is basically one documentary split into 7 parts to make the DVD special features look more impressive. An enlightening and interesting documentary, Death and Rebirth covers the project from conception to production and has many mini interviews with Aronofsky, Libatique and other crew and cast members as well as on set footage. The last part consisting of an interview with Jackman conducted by Rachel Weisz on the last day of shooting is a nice addition, although I think it serves as a separate featurette to the rest of the documentary. An extended scene of Jackman's future character onboard the exospheric craft. A beautifully other worldly sequence with dreamlike soundtrack that would make a wonderful short arthouse film on its own. The usual. As a cynic to the inclusion of these things on DVDs I am not the best person to comment on the trailers. Exactly what you would expect from a studio trying to push a 'difficult' movie to a wider audience. Darren Aronofsky himself has expressed disappointment with this DVD package and is pushing for a commentary track on an as yet unconfirmed Criterion edition of the film, which will hopefully surface in the near future with a set of features more worthy of the film.